A Kirwin Fondest Experience #1 - Applying to TCBA; receiving the entry test from Jim Lafargue; are these guys kidding - a test???? A Fiehl Fact - Jim’s Qualification Test for new managers. He grilled us on what kind of roster moves we would make if we owned the ‘73 Tigers and Giants. His strategy hint, “Try to win while planning for the future as well.” Good thing Anthony didn’t have to try and pass this one! Future, what’s a future? Is it anything like a Yoot? Marty Fiehl - As basic or simple as everyone may have thought this test was, it can now be revealed that someone we all know crashed and burned on this one. This is the same guy who stays up all night to study for a urine test! Nah, he might be embarrassed if I revealed his name. OK, I’ll give you a clue; he used to have George Foster, he used to have hair, and he used to occasionally get a hit in a playoff game. Frank Tedeschi - My first TCBA memory was in the insult/disappointment category. 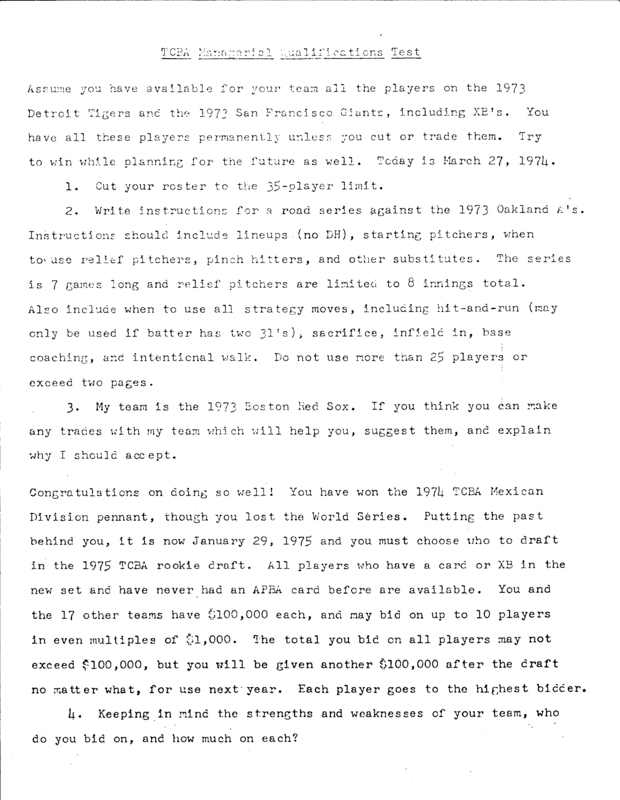 Marty Fiehl, who had recently introduced me to APBA ball, brought over a copy of an application to join a baseball league. It was based on the APBA game, and he had found out about it from an ad in their journal. The league sounded kind of interesting. It sounded competitive, and with all my knowledge about baseball at the ripe age of 17, I figured I would be incredibly great at it. So I sat down and spent what I remember as a few hours putting together my response and mailed it off to one Jim Lafargue. After some weeks passed, I was to learn that my application to join the league was REJECTED! Something about messiness and poor organization skills were cited as I recall. It is true that my handwriting is about as legible as a three year old chimpanzee’s, but all my baseball knowledge and skills -- this was just not right. Mr. Perfect Pen (Fiehl) was somehow accepted and described to me (in excruciating detail, yawn.... ) all the fun he was having drafting and trading and playing the season, and well.... up yours, Marty. As luck would have it, there was a managerial opening late that season, and Marty suggested to the league that I fill it. I wanted in. There was just one catch -- I HAD TO RETAKE THE TEST! Well, when pushed I can write well enough that people with good vision can actually read the words. I invested another 3 hours on the damn thing and sent in my application again. I do not think there were any other applicants, and I was allowed to join TCBA.